See trends that reveal opportunities. Monitor for trends to monetize them. With our intuitive AI and machine learning capabilities business professionals never miss micro-trends that require actions to save costs or optimize revenues. Trendalyze is an analytics and monitoring platform that helps people to discover trends and manage their businesses based on factual patterns in granular time series data. Sensors and other technologies collect vast amounts of valuable time series data that Trendalyze business users can instantly visualize and analyze. Like DNA, every time series data contains numerous hard to see patterns that Trendalyze users can easily extract and turn into knowledge. Microtrends reveal what the averages obfuscate, and, thus, Trendalyze users can react to previously unknown exceptions and opportunities faster. Trendalyze is as intuitive as web search because each micro trend is like a word which meaning and call to action business professionals understand. Trendalyze does not just find needles in haystacks; it constantly analyzes and monitors all needles to present the most relevant information. Sharable libraries of micro trends allow users across the enterprise to build quickly pattern based strategies and management dashboards. Trendalyze offers the most intuitive way to discover and analyze motifs in time series data. Do you collect time stamped data? Manage the future with micro trends monitoring and accurate predictions. Do you know that there are hidden opportunities in your time series data? Profit from the discovery of valuable micro trends in your time series data. With easy to use, highly interactive visual exploration tools powered by machine pattern detection, business professionals can quickly find the micro trends that lead to outcomes they want to understand and manage. Highly scalable infrastructure and innovative metadata management allows the platform to ingest massive volumes of time series and IoT data and search for micro trends across all business dimensions. When business professionals set up monitoring dashboards and alerts for particular micro trends, the platform searches continuously for their occurrence across millions of devices, sensors, or transactions. The Trendalyze platform gives organizations the power to monitor performance, improve outcomes, save costs, and optimize revenues based on the discovery of micro trends captured in huge volumes of granular data. Behavioral based revenue optimization is key for gaming companies who want to stay competitive and to expand their market share. It gives us the ability to maximize both revenues and customer satisfaction. Trendalyze provides really powerful and yet intuitive tools for pathology research, detection amd monitoring. 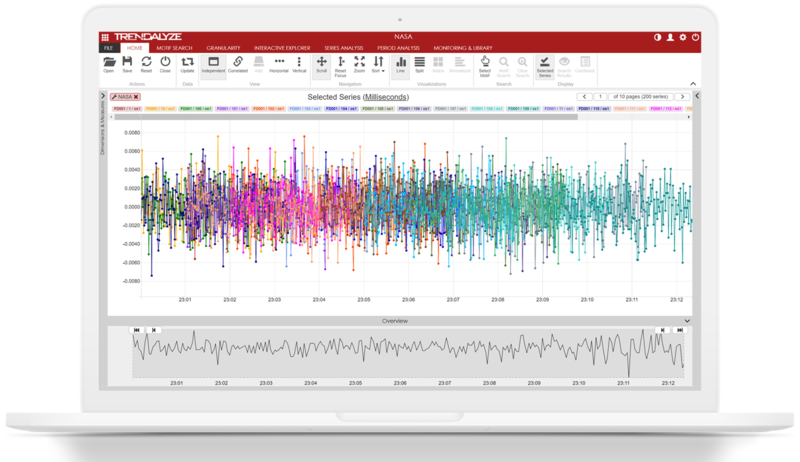 When you collect 200 readings per patient per second and you monitor over 35,000 patients, you need discover, analysis and search in one tool box that scales. Trendalyze enables professionals to unlock the value of time series data by searching and monitoring for micro trends to monetize profitable opportunities. ©2019, Trendalyze, Inc. All Rights Reserved.